Dear all, so I'm back with another skincare review. 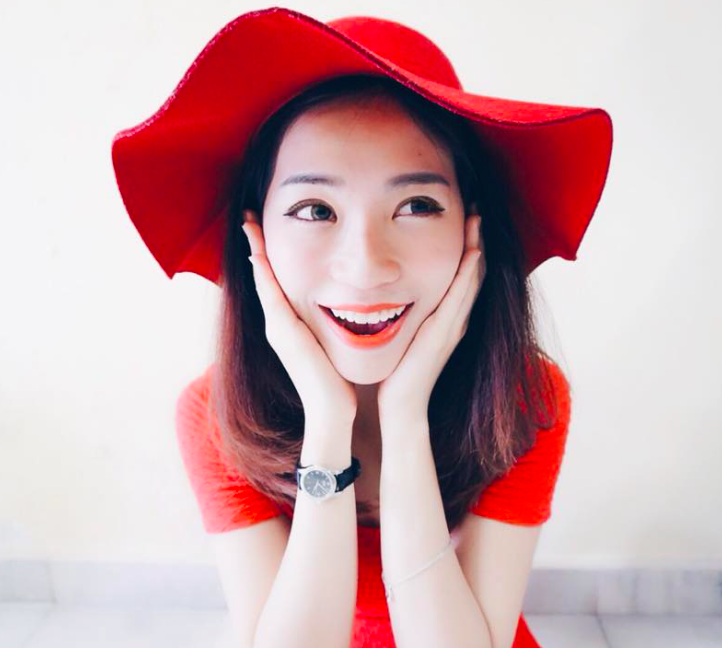 If you are my readers, then you should probably know that i have very very sensitive skin due to acne. But now, my skin is acne free *thankful* ..I can finally try out others skin care to keep my skin healthy, like FINALLY! I'm a sensitive skin type, that's why i need extra care. I need something really mild and benefits my skin. You know what, I'm looking for a skin care that suits my skin, that i can use it for long term ( tired of trying out different brand ) .. 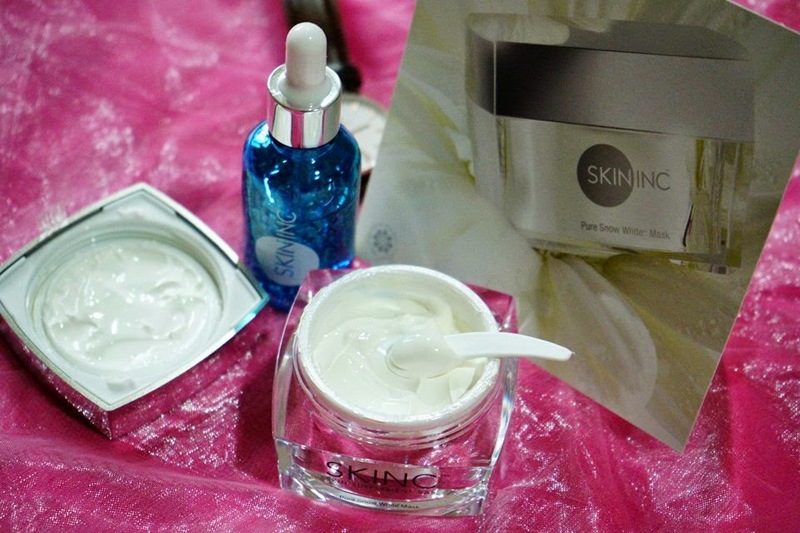 Recently, i've came across this award-winning skin care, SKIN INC. 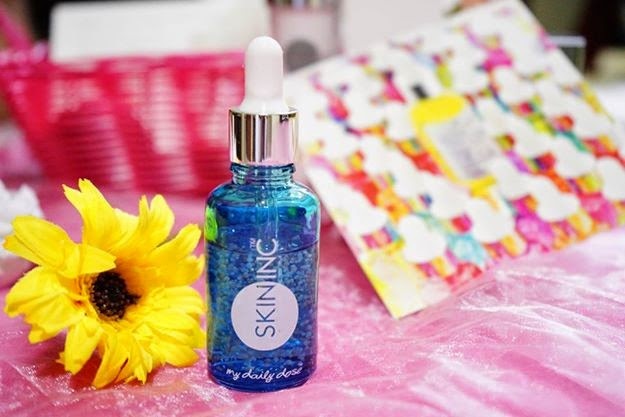 Skin Inc is the world’s first Skin Supplement Bar offering highly concentrated, 100% pure and active serums and skincare from Japan. It is a brand specialising in the latest skincare technologies and the custom-blending of skincare to suit an individual's needs. Everyone's skin is different, so individual skin identities and their needs are addressed with products and treatments that are targeted at delivery to the skin's deeper layers where it matters. YES, meaning that.. you can customize your own skin care that suits your skin. It's for you, JUST YOU!! Cool right? Basically, these are the products i got from Skin Inc. It's all their best selling item! It comes in pretty packaging, especially the get-awesome-skin set and the Xmas gift set. hehehe. I'm the type of person that can be easily obsessed of nice packaging. I'm a lazy girl when it comes to taking care of my skin but the cute bottle and colorful little bubbles inside it excite me every time when I do my skincare routine. Containing high performance ingredients, this revolutionary and multi-action product renews and restores youthful vitality to your skin. Suitable for oily and acne prone skin, this gentle but powerful peel detoxes skin cells, prolongs cell life, strengthens skin collagen and elastin, and repairs UV damage. The Pure Revival Peel also acts like a super-dynamic primer, revealing skin that makeup can glide on perfectly. Skin is restored, maximizing the absorption of active ingredients in your daily skin care products. Exfoliation is a key process to clean and healthy skin. Normal cleansing is not enough, we need to do scrub at least once a week to remove the dead skin so that it's easier for our skin to absorb whatever we try to apply. But my skin is too sensitive, i can't use scrub..so i tried this…and I was very pleasantly surprised that despite its seemingly ‘lightness’ it has done a great job in removing dead skin and making my skin feel brand new without any tugging or redness. I loved how smooth and ‘detoxed’ my skin felt afterwards. How it works : Applying it, as advised, on dry skin – and after gently massaging it in in a few seconds once it turned milky – I started seeing the white old keratin particles (which signify dead skin and impurities) surfacing. A couple of minutes of massaging was enough to clear my skin and once I rinsed it off with warm water, my skin felt instantly softer and looked brighter and clearer. 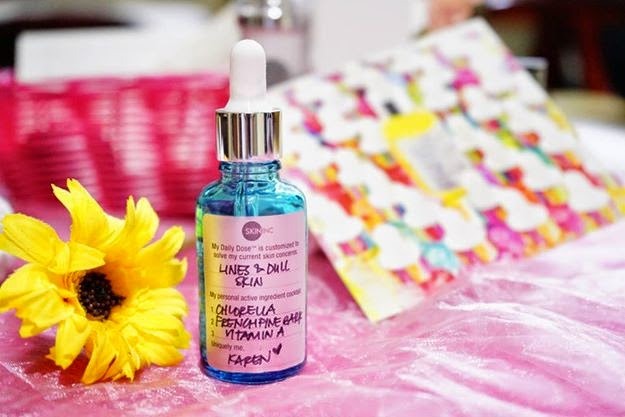 This serum has won various awards from Harper’s Bazaar, Her World and Simply Her. My favorite color is BLUE, so here's mine! Awww, I got my name on it too! I’ve been using this everyday since I got it a week ago and I’m happy to report that it’s paraben and fragrance free. Perfect for my sensitive skin! If you look closely, you’ll see colorful little seaweed beads, which burst (activate) upon application to keep the ingredients fresh until the moment it touches your skin. My skin instantly drank up the formula, leaving behind no stickiness at all. I LOVE IT! One of the exclusive ingredients which Skin Inc products boast is Okinawa Deepsea Water sourced from Southern Japan which is said to be extremely pure and full of nutrients (especially Zinc and Magnesium). This mask-gel is formulated with this special ingredient plus a few other like Soya Bean and Hyaluronic Acid. Hydrating Mask is what i always NEED! I've been using this as my sleeping mask lately and i really love the results. My skin is more hydrate every time after uses. It's jelly type mask. Applying it after cleansing and exfoliating, the mask has an instant soothing effect and when rinsed off after 30 minutes, my skin felt plumper, smoother and looked visibly brighter. I used this 2-3 times a week, my skin appears a but brighter, old spots a tad fainter, and the general appearance of my face is visibly healthier. Just 10 minutes of time works magic! It just takes 10 minutes for this mask to work its ionizing miracle – with 16 potent ingredients in this 100ml tub, it takes less than a catnap to give you snow white, flawless skin. How it works: Apply a thin layer of the mask and let it sit for 10 minutes, then remove with warm water. Overall, this products is really amazing. Works well on my skin, i guess i will continue to use it for a healthier skin! For those who are interested to try/ experience it yourself, you can find them in all SEPHORA stores Malaysia soon! The price is very affordable too compare to those branded skin care. Worth to buy!! The Skin Inc’s Award-Winning 3-step skincare regime, perfect for gift since Christmas is coming soon! (Chlorella + Hyaluronic Acid + Vitamin A). THIS IS PERFECT FOR STARTER KIT! Alright, that's all for my sharing. Thanks for reading, Hope you all like it. Don't hesitate to drop me a comment down below if you have any question! Hi, I am also having a lot of breakout lately . 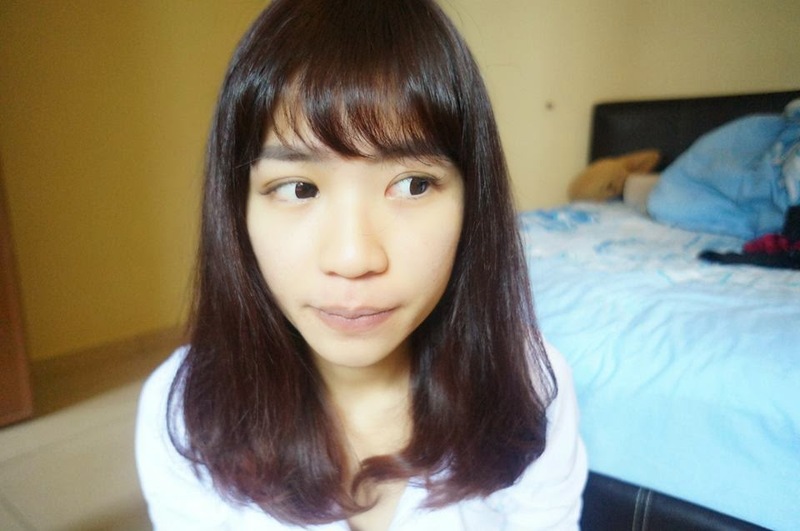 I saw the skin inc products online and wanted to give them a try , I am quite happy that I came across your blog . Great sharing ! !